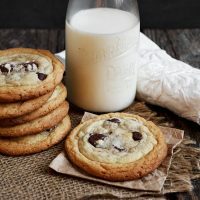 Delicious double-layer cookies, with a classic peanut butter cookie on the bottom and a soft chocolate chip cookie on top! For the peanut butter cookie dough: In a large bowl with an electric mixer or in the bowl of a stand mixer fitted with a paddle attachment, beat the butter until creamy. Gradually add the white and brown sugars, beating until creamy. Mix in egg, peanut butter, salt and baking soda. Slowly blend in flour. Add vanilla and mix well. (*If dough seems shiny (oily) and too moist/loose, add a bit more flour until it thickens and looks more matte.) Place dough in a bowl, cover with plastic wrap and refrigerate at least one hour. For the chocolate chip cookie dough: Place the butter in a bowl and microwave for 30-40 second, or until just barely melted. You don't want it to be hot. It should be mostly, but just liquid. Place butter in a bowl if using an electric mixer or the bowl of a stand mixer fitted with the paddle attachment. Beat the butter with the white and brown sugars until creamy, 2-3 minutes. Add the vanilla and the egg and beat on low speed until just until incorporated - 10-15 seconds. Do not over-mix. Add the flour, baking soda, and salt and mix until dough comes together. It should form one large ball that is easy to handle - not to sticky or not too dry. Fold in the chocolate chips. Place dough in a bowl, cover with plastic wrap and refrigerate for at least one hour. To bake: Once both doughs have refrigerated at least an hour, preheat oven to 350° F. and line a baking sheet with parchment paper. (*Note: as ovens and doughs vary slightly, I suggest baking one or two test cookies first to confirm cooking times). Remove peanut butter cookie dough from refrigerator. Using measuring spoons, scoop out a heaping Tablespoon of dough and using a small spoon, scrape the dollop of dough on to your prepared baking sheet, allowing about 4 inches between (they will spread!). Place in pre-heated oven and set timer for 6 minutes. Return peanut butter dough to refrigerator and take out the chocolate chip cookie dough. Using the measuring spoons again, scoop out one heaping tablespoon of dough and form in to a ball. With your fingers, flatten the bottom of the ball a bit (helps to keep it from rolling off!). Repeat with as many dough balls as you need for your batch in the oven. Cover and return dough to refrigerator between batches.